Due to the population upsurge and urbanization, Solid waste management is one of the biggest challenges the world is facing today. The crux of waste management is waste segregation because when waste is segregated, value can be generated; while when it is mixed, it must be either dumped or burnt. Further, waste segregation is not just leading to one evil, dumping or burning, but the associated evils such as - pollution from burning of waste, the leachate due to dumping which percolates our groundwater and contaminates it, and the fact that men and women, who work with this kind of waste, have an average lifespan of not more than 40 years. Studies reveal that only 5% of world’s 2.01 Billion tonnes of waste generated every day is segregated and the rest 95% ends up in landfills. TrashCon aims at solving the waste menace by our invented technology – A one-stop solution to segregate any kind of mixed municipal solid waste automatically into Bio-Degradable waste and Non Bio-Degradable waste upto 99% efficiency and in tons of capacity per day. It promotes a decentralized system placed at every nodal point in a city can reduce the current transportation costs of INR 1000 by 80% and can save cost incurred on manpower by 75%. Every ton of waste saved from dumping on landfills would help lower carbon footprint, lead to better standard of living and create a better tomorrow. • Requires limited power supply – Maybe twice a 4 bhk apartment! Right after we finished product development, we got our first PO from Adani. We are already processing 10,000 Kg of waste/day in India and will be processing 200 Tons by Dec 2019. Also, our clientele includes biggest of corporates globally recognized apart from the Municipalities. Our market size is 240 million dollar only in India, and the market growth is 10% YoY. Customer traction globally across Mexico, Thailand, New zealand, Australia, Africa, Nepal, Bangladesh, Pakistan and UAE. Customer traction in India is in all of the 1-tier, 2-tier and 3-tier cities. TrashCon's story has been covered time and again in the media such as The Indian Express, Outlook Business, YourStory, Telengana Today, Telecom drive and several other media publications and recipient of several awards such as Winners of Elevate 100 (2017), Top 30 Startups at Techsparks 2018, Top 2 Startups at NSRCEL IIMB, Top 5 Startups recognized by Shell, Top 5 Startups recognized by Israel Embasy, Recipient of Skoch Award (2018), Top 10 Startups recognized by UNDP, Top 60 Startups recognized by Economic Times, Winner of Woman Start-up of the year by CII (2018), Winner of Inspire Awards 2018-19. 1.Other segregator technologies across the world - Tomra, Coparm, Pyrocrat, Beston, Green Machine, Saibaarestaurant - These technologies either utilize manual segregation to a large extent, are at a very low scale, or work well in an environment with less wet waste and more of dry waste. 2. Waste to Energy plants as set up by IL&FS, Ramkey - take mixed waste and convert to energy, but are not scalable as 1 MW costs 17 crores. 1. Instead of dumping waste on streets, it can now be dumped into our TrashbotTM (MSW Segregator)– the MSW segregator automatically segregates mixed waste into biodegradable waste, non-biodegradable waste, metals and rejects instantly up-to 99.7% output efficiency – Require no manpower – Very less power consumption. 2. Decentralized waste segregation system - A segregator unit is to be positioned at nodal centers in the city or for every cluster of apartment – This set-up allows the public to have an independent waste management system and incur huge savings otherwise spent on transportation and generate value out of the bio waste after converting it into manure or biogas, non-bio waste after selling it for recycling. 3. Extremely modular and robust systems (Each part of the machine can be replaced and repaired in less than a few minutes), thus enabling easy maintenance by unskilled labor. 1. No more dumping of waste on the streets. 2. No requirement of burning or incineration of waste thus reducing air pollution. 3. No percolation of leachate in the ground water thus reducing water pollution. 4. No spread of rodents or disease‐causing flies thereby preventing waste borne diseases. 5. No more stench of waste on the streets. 6. Actual realization of 'Wealth from Waste'. 7. Ragpickers need not use their hands to segregate waste but become an integral part of the value chain by channelizing their efforts into more dignified positions such as Operators and Collectors of waste ‐ as now every bit of waste can generate value! 9. Empowerment of Citizens to realize the value being generated out of waste. 10. Reduction in the amount of greenhouse gases and thus reducing global warming. 11. 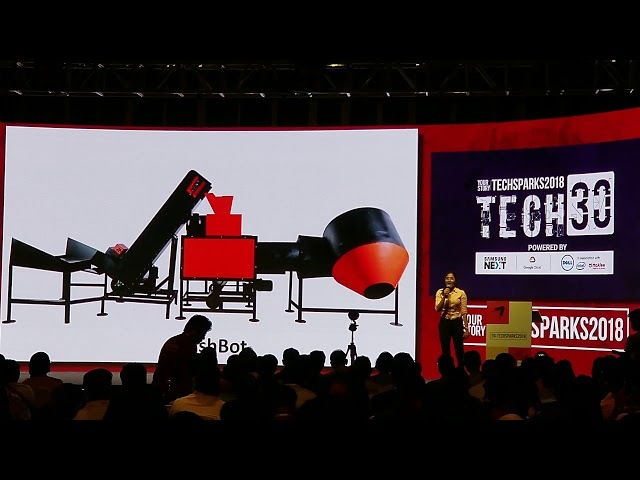 As Trashbot get adopted across the nation it has a potential to generate hundreds of jobs.